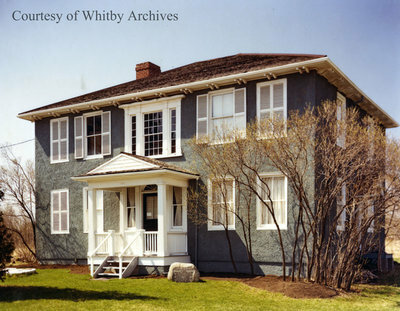 Colour photograph of Jabez Lynde's house in Whitby at its original location on Dundas Street West. The Lynde House was built at 960 Dundas Street West around the time of the War of 1812 by Jabez Lynde, one of Whitby's earliest pioneers. It was moved to Cullen Gardens and Miniature Village in 1986 and again to Brock and Burns Streets in 2013. It is now the Lynde House Museum. Operated by Whitby Historical Society - Built c. 1812 - Vistors Welcome"
Lynde House, ca. 1983, photographer unknown. Whitby Archives photograph D2016_004_003.